This very blurry image is, in fact, part of a larger image I believe. 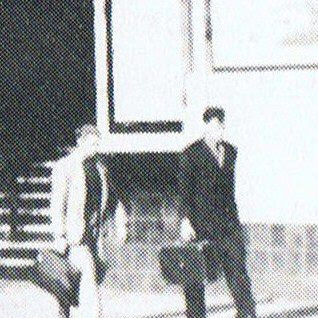 It shows two men walking alongside a building which might be Adelaide Railway Station supposedly in November 1948. You can see that one of the men is carrying a suitcase which, I think, could be a Globite and it appears to have what looks like a label on the top surface. Let me be very certain about this, there is no way we could identify these men from this image. It was interesting that it should turn as it originally did around 2010 in the Adelaide University Facebook page. The smaller of the two men may be someone who could be recognised by a descendant? 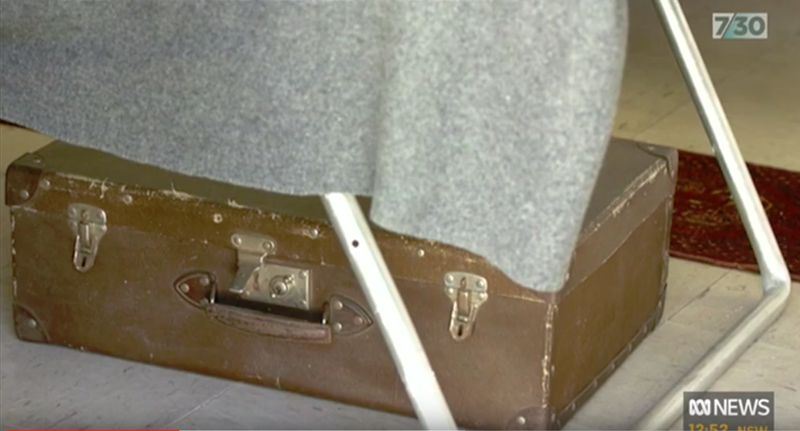 On watching an ABC programme earlier this week about the Migrant Reception Centre at Bonegilla, a Globite suitcase, similar to the one found at the Adelaide Railway Station, was shown. Here's the YouTube clip to that specific programme, you'll see the Globite suitcase about 40 seconds or so into the clip. It begs the question whether such suitcases were gifted to migrants as perhaps they were also gifted to internees at Hay and Tatura. It appears that many thousands of Balts arrived and stayed here at Bonegilla, they traveled far and wide for work including to South Australia and to Woomera. 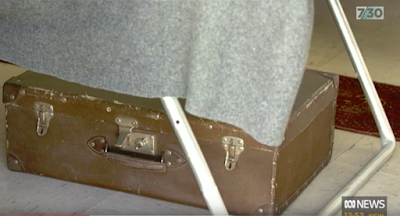 The SM suitcase, (or did they call it a 'port' in those days? )was said to have once had labels on the top but they had been removed. What's interesting about that thought is that removing luggage labels in those days was I think not so easy. They were firmly applied with a particularly strong glue presumably to stop them being worn off or knocked off in transit. However, not too many Globite suitcases with labels to be found on the internet. Perhaps suitcase labels were reserved for the more wealthy travellers who stayed in swank hotels and a Globite may not have been their 'port' of choice? SOMERTON MAN: WAS THE BOOK A SIGNAL IN ITSELF?